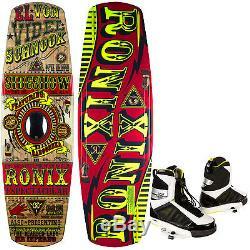 Ronix El Von Videl Schnook Cable Wakeboard Mens + Liquid Force Bindings. 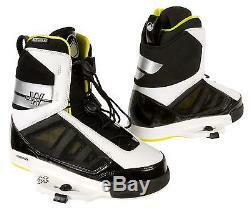 Ronix El Von Videl Schnook Cable Wakeboard 136.3 Mens + Liquid Force Bindings. The bindings in this package are available in sizes 9-10, 10-11, 11-12. The recommended weight range for a 136.3cm wakeboard is 150-190lbs The binding sizes are based on availability of the bindings. If you have ANY questions we'll respond quickly bringing you 15+ years of riding and instructing experience. Board - New for 2014 is a totally re designed electronic hot lap cable special deck. Last year with the help from engineers and riders in 6 different countries and came out with a 90° turning, rail shredding aquatic device. Cable riders usually ride 4 mph slower, so you need to make up for that in added buoyancy. This board runs longer - so if you usually ride a 142 boat board - demo the 146.3 in this shape. A fast, flatter rocker means more contact with rails for added control, and along with the steeper sidewalls allows the board to ride higher with more glide speed. Plus longer boards are funner to press out. Boat boards are designed to set an edge, and constantly build an arc as you progress into the wake. Cable riders who do air tricks you want to set and maintain an arc without adding onto the angle. This way you have a predictable take off around the bend, landing with more forward momentum. A cable rider has to leverage into an ollie, or press onto a rail but just as important (which gets overlooked) is it has to snap back too. So you want to have more control, feel, and yes flex on a cable board - but only if it has a pivot point. So Ronix sourced this fancy new paulownia environmentally conscious short harvest time energetic new resourceful tree and a maple stringer running down the length and shaped it up into bits and pieces of rockers and rails. Then added their diamond glass - having a thin tip/tail shape and a really light glass in the tip and tail exaggerates everything you need on a cable. As a rider locks onto a rail the energy but is than able to leverage off signature magic carpet lay up. This past off season Ronix built their own R&D facility to ride and research behind the boat or the cable park Lake Ronix. Thru all of their cable testing there they stumbled upon 2 big advancements. They added foam cut outs in the middle of the board this helps reduce those big impacts on landings when y. Concave Bottom Tips - Effortless ollies and more controlled presses. G&R Technology - Grip and Release channels have all the traction you need for boat or cable riding without creating unneeded resistance with the water. G&R Part 2 - side to side stability and allow a rider to control a flick easier at a cable park. Thinnest Profile - More feel for consistency on all types of surfaces. Finless - Too big of a fi n and a board gets hung up on rails. Nocturnal Run - We have a small run with recessed lights running thru the board. ABS-less - Krypto cable prevents delams, but unlike ABS it doesn't trap as much resin, so you have a lighter board that is just as strong. 4 fiberglass babooshka fins and 4 fiberglass utility fins. Binding - Faster, stronger, and more determined than ever Shawn Watson has been working out in the off-season and sohas his binding. All new for 2014, the Watson Pro is our most technical high performance binding. The Watsonbinding provides fast response and just the right balance of flexibility and support. The new venting strutsprovide lock down lower foot support and free flowing drainage to shed water quickly as you plane up. The newReflex Liner improves the comfort while locking you in for direct connection to the water. The 2014 Watson Probindings bring you technological precision and perfect performance. Key Features of the Liquid Force Watson Wakeboard Bindings. IPX Chassis: Injection molded Nylon plastic chassis with metal teeth. Impact GEL: The most advanced impact shock displacement material available on bindings. EVA foot-bed: 3D molded foot-bed with ergonomic contours. Reflex Liner: Seamless design, heat molded, and non-intrusive back tweak zone. Zonal Lace System: Lacing system allows you to adjust lace tension. Articulating Cuff: Fluid forward motion of the upper and lower overlays. We reserve the right to use either company. Failure to do will delay your order as we'll need to capture the needed amount or a physical address. The day your order ships is not considered a transit day. Please be sure to double check your address when checking out. To see our help desk. We have lots of brands that can so please have a look through our store or shoot us a message if youre looking for something in particular. We take customer service very seriously. Our priority is to offer the best shopping experience possible. All emails are replied to in less than 24 hrs. 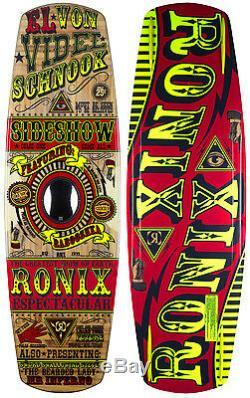 The item "Ronix El Von Videl Schnook Cable Wakeboard 136.3 Mens + Liquid Force Bindings" is in sale since Friday, September 30, 2016.